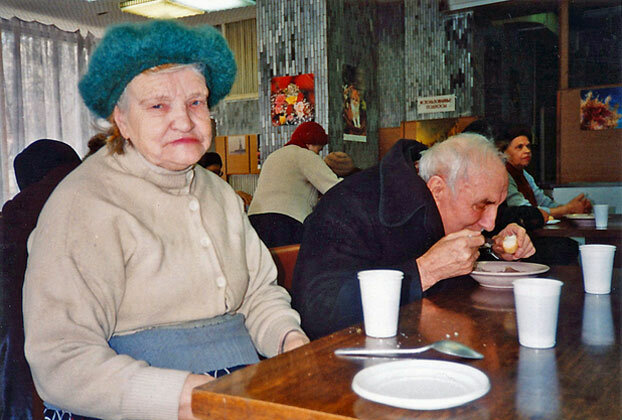 Moscow, 1994 – It was a day like any other at the soup kitchen for Alexandria Kunitsina and her husband, Michael. The couple sat at a simple table while volunteers served them a bowl of soup with a chunk of meat, plus rice, tea, bread, and a salad. Alexandria pulled out a glass container from her purse. “For leftovers,” she explained in Russian. At age 76 and 78 respectively, Alexandria and Michael were born under communism, survived two wars, lived through Stalin’s terror, did well under Leonid Brezhnev, the Soviet leader from 1964 to 1982. What do they have to show for it? Almost nothing, given the collapse of the Soviet Union and the social safety net that went with it. They receive monthly pensions of about $20 a month. Three years ago – before inflation – that was a gold mine. Today it buys one person a loaf of bread and a small chunk of sausage each day for about 20 days. Michael slowly pulled out a red card, his veteran’s card, from his pocket. His wife explained he is an injured veteran of World War II. And then he started crying. “We didn’t think it would be like this,” she said. In cities and towns throughout Russia, millions of elderly Russians can’t afford to eat because their pensions can’t keep up with the inflation rate. Last year, the government said 40 million Russians – about 25 percent of the population – were living below the official poverty level. 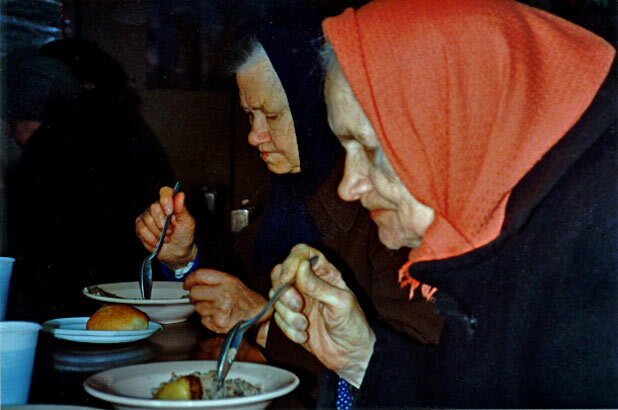 Several foreign organizations have stepped in, providing hot meals for the elderly poor in Moscow. The largest is through the Moscow Protestant Chaplaincy which began serving hot meals shortly after the collapse of the Soviet Union in 1991. It now operates three soup kitchens, serving more than 7,500 hot meals a week. Russian social workers select the pensioners and sick who they believe are in greatest need. 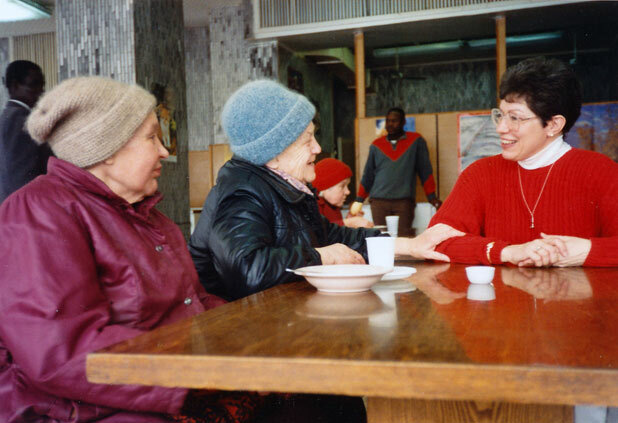 Soup kitchen volunteers help them with their coats, serve the meals, clear the tables, and spend time talking to them – even if it’s just a few simple words in Russian. There is a strict policy for soup-kitchen volunteers to not discuss religion or preach to these Russians. It is a meal and friendship, free and clear. Arlene Pipkin of Elkhart, Indiana, volunteers at the largest kitchen. “The Russians are so grateful for the food and the caring. They’re so hungry for someone to talk with them,” she said. Her husband, Wayne, is a chaplain in Moscow. Pipkin says visitors to Moscow are always welcome to volunteer for a few hours at one of the soup kitchens. They can call her at 143-3562 when they get to Moscow. To make tax-deductible donations to the kitchen, make checks payable to the National Council of Churches/Attention Food Ministry and mail to the Moscow Protestant Chaplaincy, c/o Post International, 666 Fifth Avenue, Suite 572, New York, NY 10103. Since volunteers run the program, all funds go to the meals. Seattle’s St. Stephen’s Episcopal Church is one of the largest donors to the program. Tags: fall of the USSR, Helen Holter, Moscow Protestant Chaplaincy, pensioners, Russia, Russian poverty, soup kitchens, Soviet Union. Bookmark the permalink.